Equipped with an in-house, expertly decorated movement and housed in an expensively made case, the Tonda 1950 Skeleton is typical of Parmigiani’s oeuvre. Owned by a charitable foundation with deep pockets, Parmigiani is a vertically integrated manufacture proficient in high complications as evidenced by its SIHH 2015 line-up. But even its simple watches like the Tonda 1950 Squelette are far from plain. The movement in the Tonda 1950 Skeleton is the PF705, the open-worked version of the PF700, a calibre made by Vaucher that’s also found in the Slim d’Hermes. It’s self-winding with a micro-rotor, with elegant proportions being large but flat. The case is 39mm in diameter, though appearing larger due to its narrow bezel, and stands just 7.8mm high. 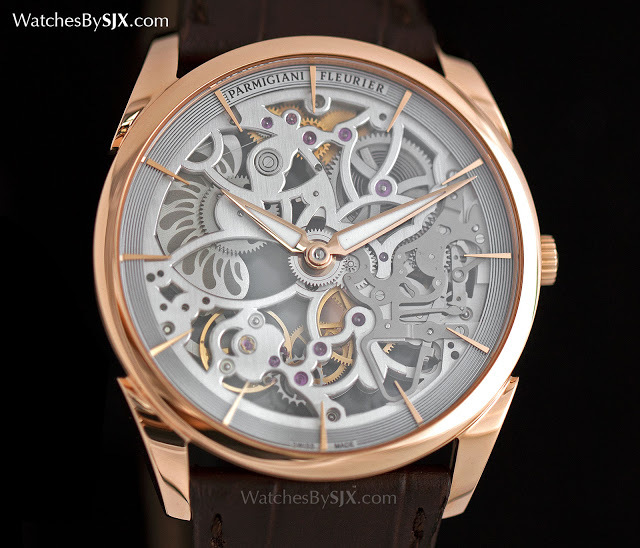 Despite it relatively modest size, the case has heft, in part due to the thick lugs that are a Parmigiani trademark. The quantity of gold required to make this case is certainly more than most other cases this size. 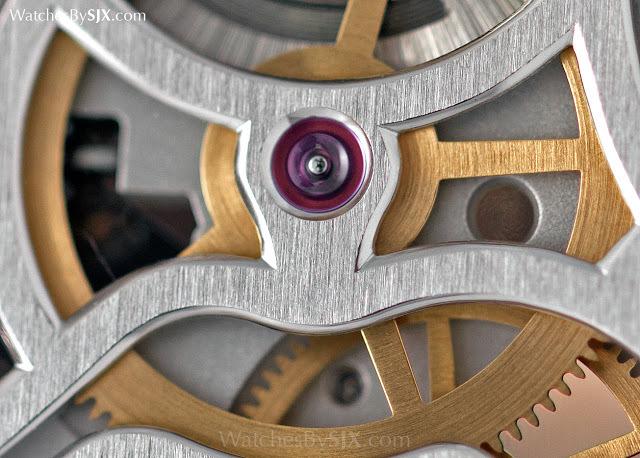 Like other Vaucher movements (it’s a sister company of Parmigiani), the movement construction is also high quality. Take for instance the free-sprung balance wheel has adjustable masses on its rim, a feature often found in higher end movements. 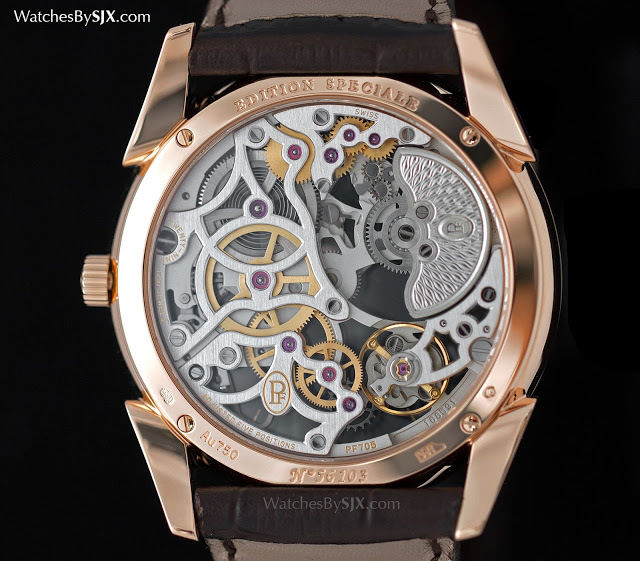 Like many other contemporary skeleton watches the bridges are finished with a simple straight graining, but high quality of the movement decoration is visible in the details. The wonderfully beveled edges of the bridges, or the circular graining on the gears. The Tonda 1950 Skeleton has been manufactured with little expense spared, a quality typical of Parmgiani. And that is reflected in the price tag of US$43,450.